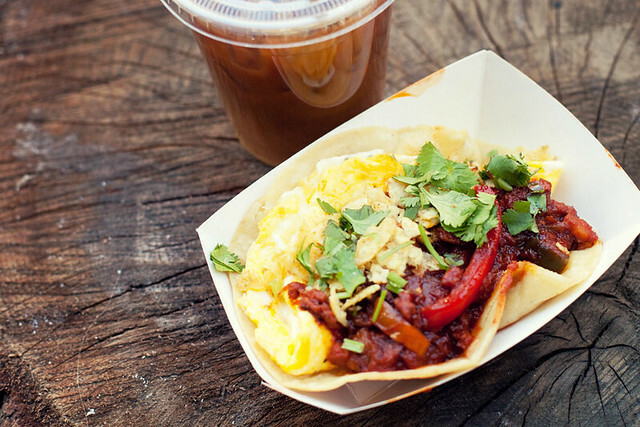 So I’m on a breakfast taco sort of kick at the moment and then when I randomly found out (seriously..it was only couple days ago and I already forgotten where I heard about it) about a place in South Williamsburg that serves JUST breakfast tacos and coffee. PEOPLE!! BREAKFAST TACOS AND COFFEE!! Whirlybird on S. 2nd between Roebling St & Havemeyer St is tiny shop. It has 2 counters…or enough seats for 8 people. When I was there someone was spinning vinyl records and the atmosphere was chill. For $3.50 I got a taco with eggs, oxaca cheese, salsa, and for $1 I added chorizo (OH and it was topped with pieces of chips for extra crunch). WOO! Oh..dude was this taco good. Even though they only used 1 tortilla, it held up the filling. This was eggy, spicy, messy and I washed it all down with an iced coffee.